We are thankful, for you! The festive season is upon us and in the United States this begins with Thanksgiving Day which has been celebrated by many since 1621, traditionally celebrating the harvest and other blessings of the past year. Today we wish to join in this festive celebration, to show our gratitude and appreciation for our customers. Without you all, SmartBots would not be possible. We would like to extend our heartfelt thanks to you with our thanksgiving gift. Use CYBER18OFF20 coupon to get 20% discount on all Store purchases! It is with your continued support, creativity and feedback, that we are able to work with you and improve for you! 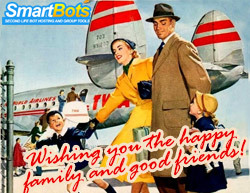 We are so thankful to you all and appreciate you being part of SmartBots.